AND Une régente et une femme de chevalier. 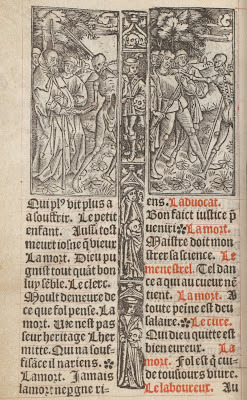 AND Les âmes damnés aux Enfers. The series follows the traditional pattern of a 2-part didactic poem whereby death calls women from all walks of life to join the inevitable 'Dance of Death', and the women respond. 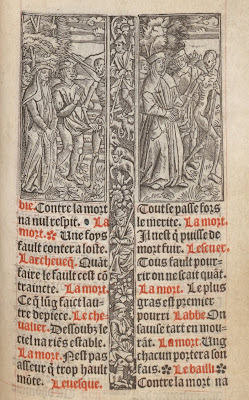 An illuminated manuscript was also made of the series and together they contribute some further understanding about the lives of medieval women - as investigated in the 1994 'The Danse Macabre of Women: Ms. fr. 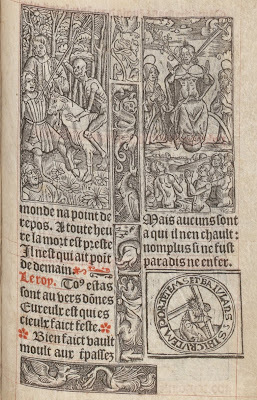 995 of the Bibliotheque Nationale' Ed. Ann Tukey Harrison, Kent State University Press. 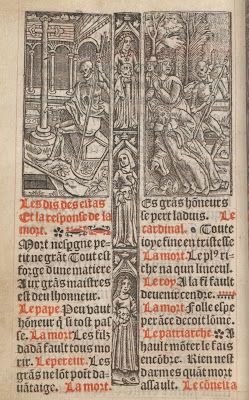 Both the original and female versions of Marchant's 'Danse Macabre' books came to be combined in a single publication and the Médiathèque de l’Agglomération Troyenne have a wonderful web presentation of a late 17th century ammalgamated text (click the image for a flash 'turn the pages' view or click bottom left for a zoomable html version).
' 'Oh Death! 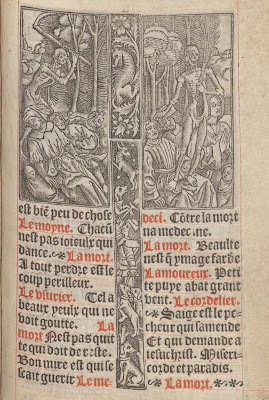 ': Death, Dying, and the Culture of the Macabre in the Late Middle Ages' Prepared by Emily Rebekah Huber as part of the Camelot Project at the University of Rochester, New York state. 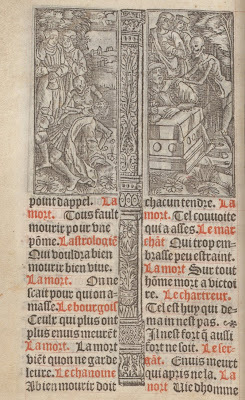 1I've now found the earliest book version of the 'Danse Macabre' online, from the 1460s, which I'll post somewhere along the line.